Unto Ashes ist ein Musik-Ensemble, das 1997 von Michael Laird gegründet wurde. 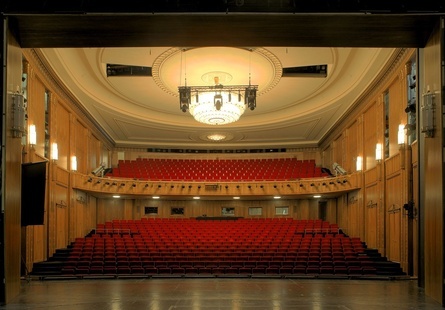 Aktuell besteht die Band aus den Künstlern Michael Laird, Ericah Hagle, Paul Ash, und Bret Helm. 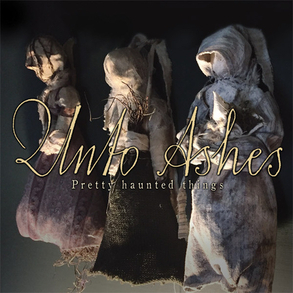 New Unto Ashes Album "Pretty Haunted Things"
Press release from Projekt Records dated 22 April 2019 C.E. "Unto Ashes conjures a stirring and captivating album, simultaneously beautiful and unsettling. Pretty haunted things — their eleventh Projekt release in a career stretching two decades — effortlessly spans the ages from a dark and medieval flair to modern apocalyptic gothic-folk. Recorded almost entirely in an octagonal Victorian parlor room, bewitched by centuries-old traditions, the songs of reflective solemnity are swathed in dramatic, soaring choruses executed by Ericah Hagle, Michael Laird, and Bret Helm (of Audra). 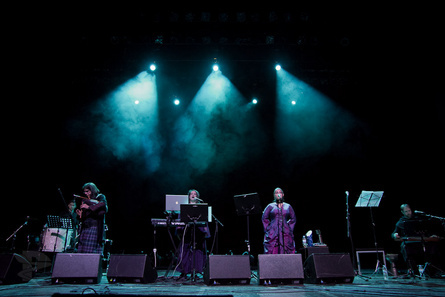 "The music harkens back to their groundbreaking debut, Moon Oppose Moon (PRO106 – 1999): Unto Ashes has wrought music with an unusually broad array of diverse instruments, including hammered dulcimer, harmonium, autoharp, psaltery, viola da gamba, acoustic guitar, piano, and Arabic percussion. The songs are masterfully crafted by Laird, whose enchanting production is characterized by a gossamer of sonic treatments. "The eerie, olden-skills Poppet dolls that adorn the covers seem to beckon the listener with binding spell of ensorcellment. "Two songs are graced with words by 19th-century authors, namely Emily Bronte (“Fall Leaves Fall”) and E.A. Poe (“Alone”). Fans of Unto Ashes are well aware that the band has crafted many fine and completely original cover songs, and indeed their 2014 release Ghosts Captured contains no less than 25 (!) of them. On Pretty haunted things Unto Ashes pay homage to one of their early heroes, Gary Numan, with a breathtaking cover version of “My Dying Machine” performed exclusively on Arabic and Oriental instruments. "The title of the album (taken from a line in “I’m Too High”) obliquely references the pretty and haunted songs contained in it. Or is the band referring to the Poppet dolls, which are both pretty and haunted; or to people they either know or have not yet met? Regardless, Pretty haunted things might just be one of their finest conjurations to date." Founded in 1997, Unto Ashes are among the foremost purveyors of "blood-lit" music, by which they seek to explore the beautiful and terrible currents that weave themselves through our lives. Their highly original music is informed by Medieval dirges, Apocalyptic Folk, Black Metal, Spinning and Harvest chants, and German Romantic sensibilities. Epic and exalted; claustrophobic and suffocating; vital and menacing; glorious and impenetrable: Unto Ashes is all - and none - of these. Unto Ashes utilize an unusually broad array of ancient and modern musical instruments to achieve their truly unique sound: harmonium, hurdy-gurdy, Appalachian and hammered dulcimer, Persian and African percussion, cello, French horn, acoustic and electric guitars, piano and synthesizer, Indian tamboura, and bombastic drums. Their signature vocals and vocal harmonies have been described as "exquisite" and have been ranked alongside the foremost Heavenly Voices ensembles. Unto Ashes recordings and live performances are compelling, hypnotic, and powerful. We invite you to partake in Unto Ashes "blood-lit" music courtesy of Projekt Records, youtube, and innumerable international compilation appearances.